One of our strongest capabilities at PCR Technologies, Inc. is our work with adhesive and insulator preforms. Through drilling, routing, and die cutting, we produce adhesive preforms for various industries. Using CNC - controlled, high-speed, multi-spindle equipment, we are capable of working masterfully with such preform materials as pyralux, ablefilm, cybond, kapton, no flow pre-pegs, thermabond, and nitro phenolic. 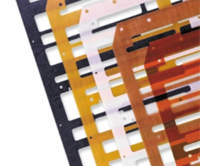 The range of substrates we work with is equally comprehensive: flexible composites, electronic film adhesives, epoxy-based films, adhesive transfer tapes, thermally conductive insulators, thermal interface materials, and rubber gasket materials, as well as epoxies and rubber gasket materials. The results of this high-tech proficiency and accumulated knowledge are adhesive pre-forms that feature thicknesses of .002", lengths up to 48", widths of up to 24", and minimum radiuses of .015". Our Quality Management System is ISO 9001:2015 & AS9100D certified, we are ITAR registered, RoHS Compliant and provide AS9102 First Article Inspection Reports upon request. For more information on our adhesive preform capabilities, see the table below or contact directly. ISO 9001:2015 & AS9100D AS 9102 F.A.I.R.